Thursday, October 27th marked the last closing art reception for The Project Box. The Project Box has been one of my regularly featured galleries for my Artist Statement Minute series on Uncovering Oklahoma so I went there to say goodbye. I’ll miss working with them. Friday morning started with the release of my new 10-minute documentary on the Paseo Arts District. After that was published, I worked on getting ready for the Norman Fall Fest. 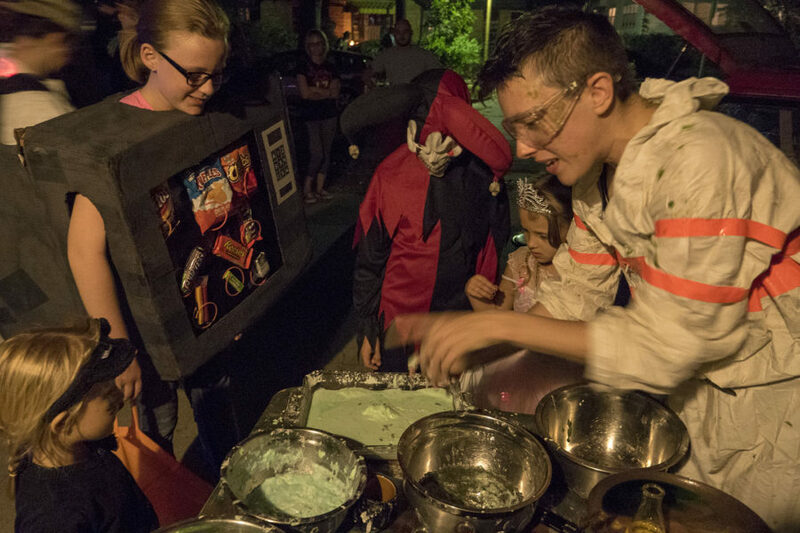 The event closed down Main Street in Downtown Norman make for a safe environment for trick-or-treating, performances, and activities with an emphasis on inflatables. I was invited to have a booth this year. My wife suggested doing bubbles and having a “boobubble” station because it would be simple, easy, and kids would love. She was right about everything. I had a table set up where one of us would hand out the treats while there were two big buckets that either my friend Michael Roberts, Leslie or I would make giant bubbles, along with two small bubble making machines. People loved the bubbles. Everyone was taking pictures of Michael making big bubbles. For the event, I also supported and brought awareness to the Teal Pumpkin Project by giving out bubbles, stickers, and stamps instead of candy. We had several parents tell us how much they appreciated us giving out treats because of their child’s food allergies and that we were the only booth doing the Teal Pumpkin Project. We all had fun at the Fall Fest. The event was packed. I didn’t get a chance to walk around and see whatever else was doing at the time, and consequently, I didn’t get to eat either. This was my first doing such an event and so I have notes for improvements for next time. I went to my first sportsball homecoming festival on Saturday for the Oklahoma Sooners football. It was fun walking around OU and Campus Corner to see all the businesses and the collage celebrating homecoming, people tailgating, and the vendors. I loved the movie themed parade floats this year. Overall, it was kind of strange being there as I felt a bit like an outside looking inside a whole different culture. Sunday, Leslie and I visited the Plaza District for their Day of the Dead celebration. I took pictures and video for Uncovering Oklahoma and District Up. I loved how this year the festival became more of a community event. For example, Pie Junkie, which is normally closed on Sundays, opened up because of the festival. Four of the Quarter Minute stories were accepted into the 15 Second Horror Film Challenge! With 450 entries from hundreds of filmmakers worldwide who only had 15 seconds to be new voices of horror, the above video features all of Season 2’s entries. The 15 Second Horror Film Challenge is a not-for-profit international contest which celebrity judges rank Top 20, share their personal Top 5 picks, and award films in a variety of categories to be announced through November. The stories I submitted were Fall Ritual, Float Like A Bee, Un-Synced, and Last Days. A trapped ghost. This was not a prop, but an actor. For the Halloween tradition, friends and family would gather at Leah and John’s house to do a big shindig. We don’t simply just pass out candy but have interactive displays, games, and performances with every year revolving around a theme. This year’s theme was Ghostbusters and the story had the Ghostbusters parked in front of a haunted house they were investigating. Lessa and Jessi had a science show for kids. Leah would run around and capture ghosts and monsters. Jay was a trapped ghost. Everyone had a role. Leslie and I were dancing skeletons and I would also scare people. As with every year, it was a blast.